by jeff Velocity 1 - 2006 This is clearly when color coordination was my top priority. First and foremost, thanks to Amy Bolger for the awesome photos. What you don't see in my photo are the PONY'S with mountain bike pedals and straps for the feet. I borrowed that jersey and those bike shorts were in the collection since I was 12. That was my first draw to the track and I have been hooked ever since. The beautiful thing about VeloCity is the nature of the event. It's designed to get them messengers and commuters that ride them track bikes to and fro or even the Kings of Milwaukee Ave who just have that urge to hawk people on the way in to work. 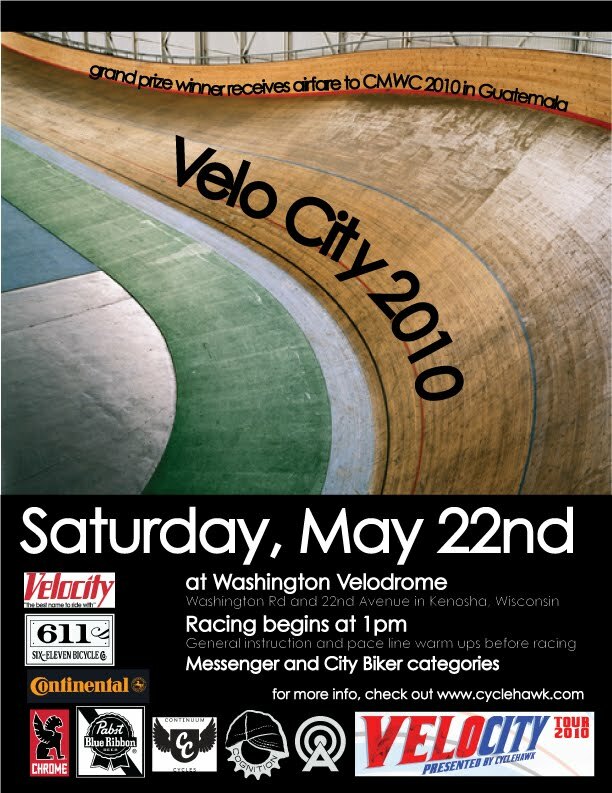 We want to get ya'll out there and learn some appreciation for the sport and try the velodrome out. Intimidation and judgment are not in the cards. Razzing and a little ball busting might be but that's what it's all about. And there is certainly more swag and prizes than you will EVER see for racing at the track. Oh. And it's free. No excuses. If you think of it as intimidating, I'll be more than happy to share my fears from 2006 when I've been a messer for over a year and these badass lookin dudes from NYC come in with a corporate sponsor and throwdown crazy events I've never even seen before. I only made it to the opening night and the 1st day of races. I was pretty bummed to miss out on day 2 but I'm glad as hell that I went up there and gave 'er a shot. Please feel free to join us this Saturday, May 22 at Kenosha Velodrome in Washington Park. It will be fun to spectate and certainly a good time to participate. Regrettably, I will not be in attendance but Ben will run the show. The event starts at 1. Bus is leaving from Green & Kinzie around 11. 11:30 wheels rolling. Racing is free to everyone and be sure to bring a helmet and some drop bars. Stay curious my friends. Special thanks to teeners for the Chicago flier work and julio for coordinating like mad. And, of course, Squid.